Anyone who’s ever talked to me about dining in Bangkok knows my passion for spreading the word of Soi Polo Chicken. You’d think that’s the only chicken I ever eat in Bangkok. As much as I’d love their beautiful fried garlic encrusted chicken every day of the week… well, that’s not incredibly healthy. Thai’s do a mean grilled chicken as well. That and some Som Tam is a tasty meal that’s not too bad for you. My favorite for grilled chicken currently is “Hai”. Hai is conveniently located on Soi Convent road, very close to the Sala Daeng BTS station. 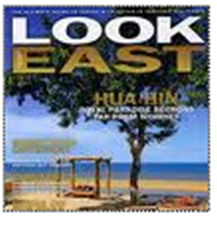 It is also minutes from my former office at Lookeast Magazine. My friend Mario and I would regularly venture down to Hai for a cheap lunch of grilled chicken, som tam, and larb phet (duck larb). It’s fresh, fast, and a great weekday lunch in Bangkok. I started going for the grilled chicken. Grilled to perfection, the chicken is juicy with just the right amount of crisp to the skin. But I soon discovered that the real reason to go was the Som Tam. This is a classic dish everyone needs to try when in Thailand… and this is a great place to do it. Many friends have told me that it’s one of the best they’ve had in town. To start off with go for “Som Tam Thai”. This version lacks the nastier fermented crabs that aren’t for most foreign palates. Round out a meal for two with one of their many “Larbs” (a thai meat salad). You can’t go wrong with any… I reguarly get the Larb Pla Dhuk (cat fish), Phet (duck), or standard (minced pork). Service is quick and prompt. They’ll usually send round one person who speaks a bit of English to deal with the foreigners, so while it is mostly a local joint, you won’t feel out of place or unwelcome.
. I’d definitely recommend Hai Somtam Convent to anyone looking for a fresh, local meal in Bangkok. Best bet is a weekday lunch. TOTALLY my favorite place for som tum and kor mu yang in the whole of bangkok. I LOVE that place. Wow! you really know the place to go for Somtum As a Thai, I am impressed. My staple order-ins! Soi Polo Chicken and Som Tom on Convent. The chicken rice from the stall acorss the somtom is reallly good too. Sigh I miss Bangkok terribly. Living there was quite a blast!